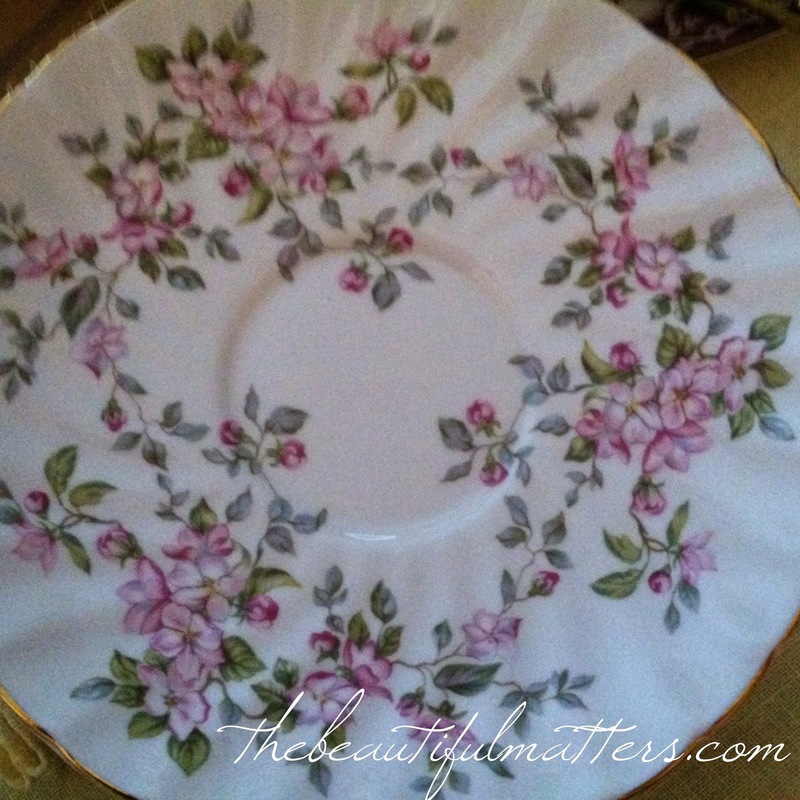 It's lovely to have a friend over for tea and set a special table with nice china tea cups and pretty linens. We might bake a special treat, put some flowers on the table, and light a candle. But what about when we're at home alone? 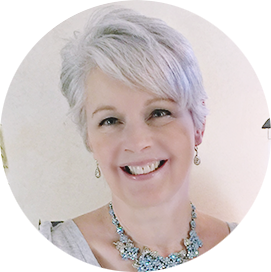 Do we treat ourselves with the same special care as we would a treasured guest? Or do we pour a mug of tea, dunk the bag a few times, take a gulp, and hurry through our work while it gets cold on the counter? I think it's really important to stop and take tea properly, even if you're alone. It doesn't take that much extra time, and the beauty and calm that will surround you will rest you and make you that much more prepared to face what lies ahead. Oftentimes I have felt that I have too much to do to take the time to prepare a nice tea for myself. But when I sit down and wait for the tea to steep and gaze into the candelight, I become calmer, more focused, and am able to reorder my thoughts so that they aren't running ahead of me. When I had young children I was tempted to do chores during their naptime because it was so hard to get anything done when they were awake. But young mothers need rest, too. 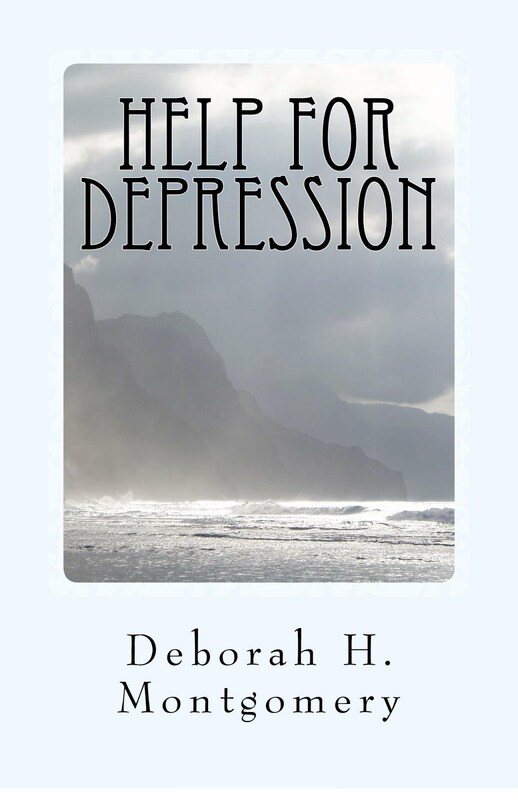 If fact, everyone needs a little respite during the day, to rest and recharge. Take the time to gather all your tea accoutrements, as well as a little stash of treats and a favorite book or magazine, so that everything is in one place and ready to go for when you want tea. Then, all you have to do is put the kettle on and while you wait for the water to boil, set things out nicely. Be sure to turn off the electronics. I bought this beautiful tea cup on Mackinaw Island (MI) many years ago. This little brown teapot came from a restaurant in Harbor Springs that closed down. I got the brown plate in Stratford, Ontario, when we went there one autumn to see a play. What is tea for one without a book? 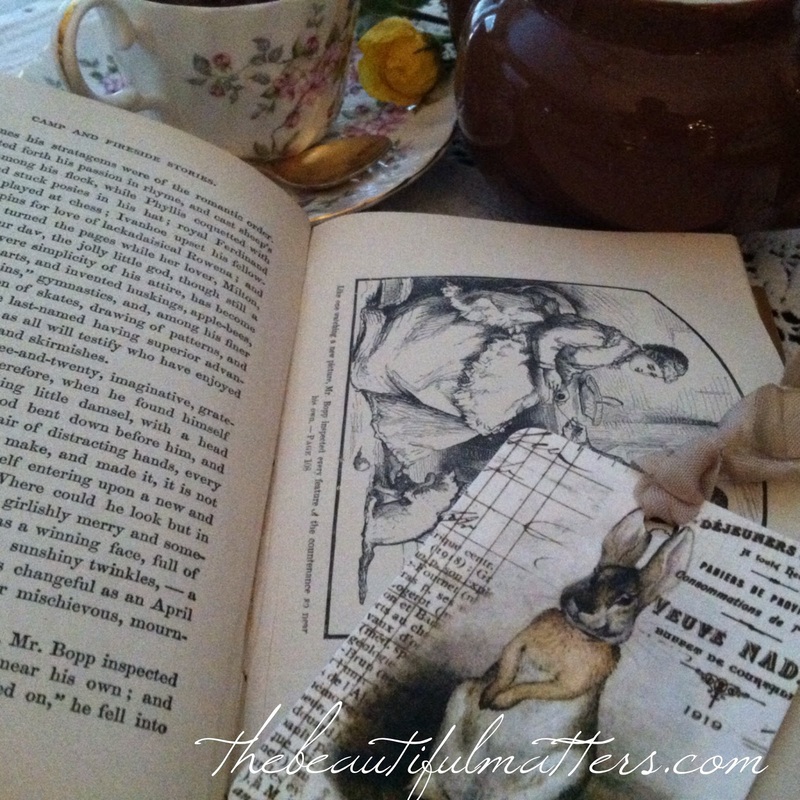 Check out this adorable rabbit bookmark with a lovely silk ribbon. This book was published in 1890. It is Hospital Sketches by Louisa May Alcott, the author of Little Women. After I took the picture, I carefully moved the cup of tea to avoid any spills. It is one of my antique treasures from my grandmother. After I looked at the delightful old-fashioned drawings in it, I settled down to our latest book club book, The Book Thief. 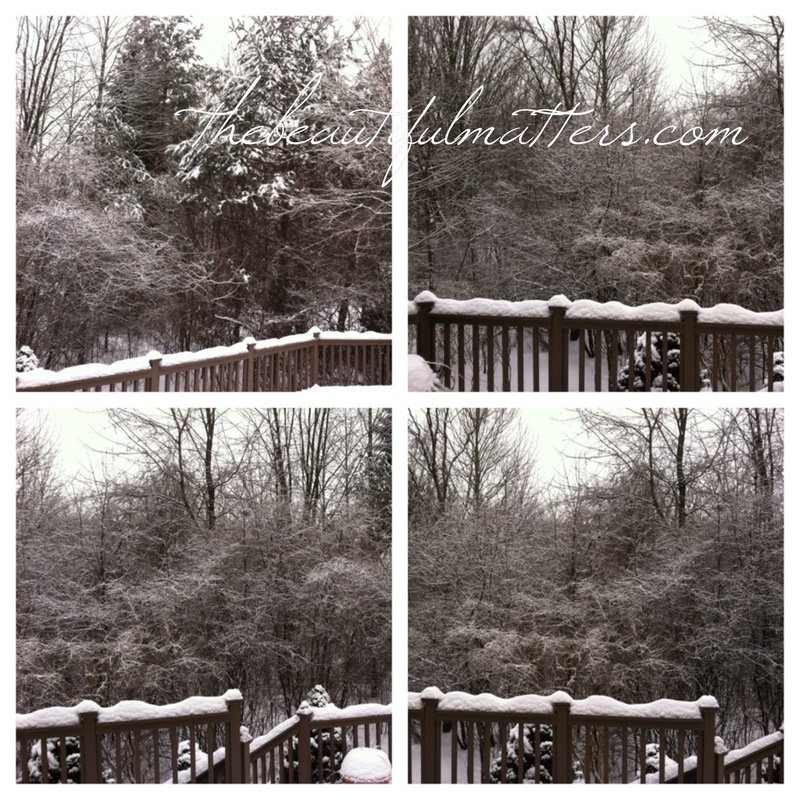 This was our backyard Sunday morning. Three to five more inches expected Tuesday. I'm so glad I've set up my tea tray. Won't you stop and treat yourself to tea, too? 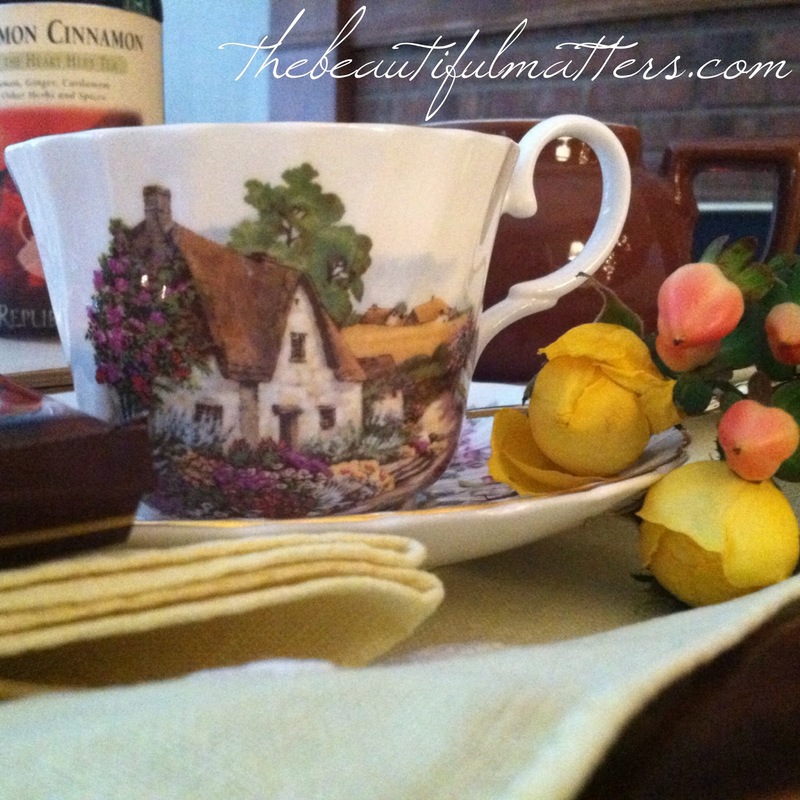 I am sharing with A Return to Loveliness, Rose Chintz Cottage, and Bernideen's Tea Time. What a pleasant visit! Thanks for the tea time. A relaxing time! I just adore your charming teacup! It is so unique with such a pretty scene. I see you have an adorable assistant. Thank you for sipping tea with me today. yes, I just made my assistant The Official Blog Cat (see sidebar). Quite an honor :). Deborah, we think alike in making our tea a special occasion and with the good china. During a busy day my hour or so to stop with a cup of tea refreshes me. Cute kitty in your chair, I usually try to drink with the dog sitting on my lap. yes, today I am running. Have to remember my own advice. And sometimes, on really wonderful days, those tea and book times can extend to a whole afternoon. Aren't we blessed!! yes, the beginning was a little difficult, but I then found it hard to set aside and go to bed last night! Looking forward to reading more today. Such a comfy tea time! I love your teacup with the cozy scene and the flowers. What a pretty reminder of the island. 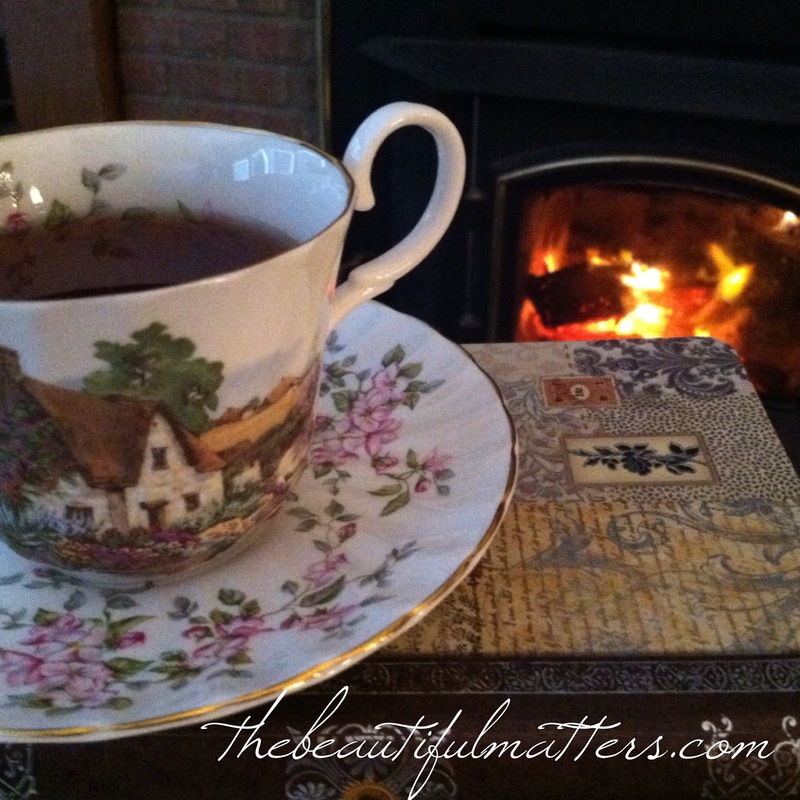 I like to take time and enjoy my tea times too! thanks for visiting Nancy. I see you're from the UP. We were up there this past October. It's so beautiful! We want to do some more exploring there next fall. What a lovely post and a good reminder to stop each day to relax and rejuvenate. 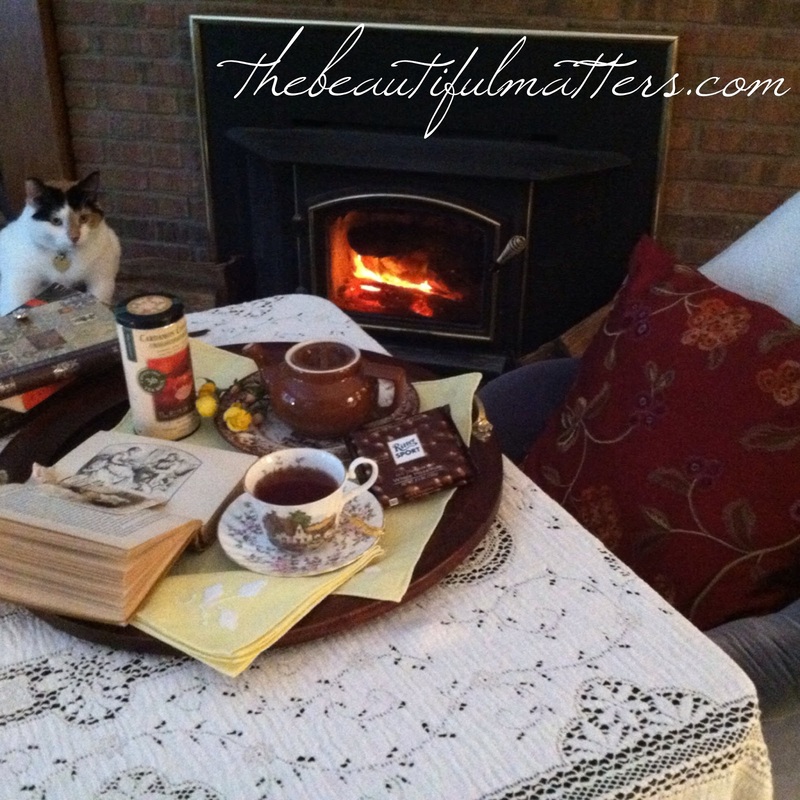 What better way to do that but with tea, a book (or two), and a precious kitty ( in my case, a pup). 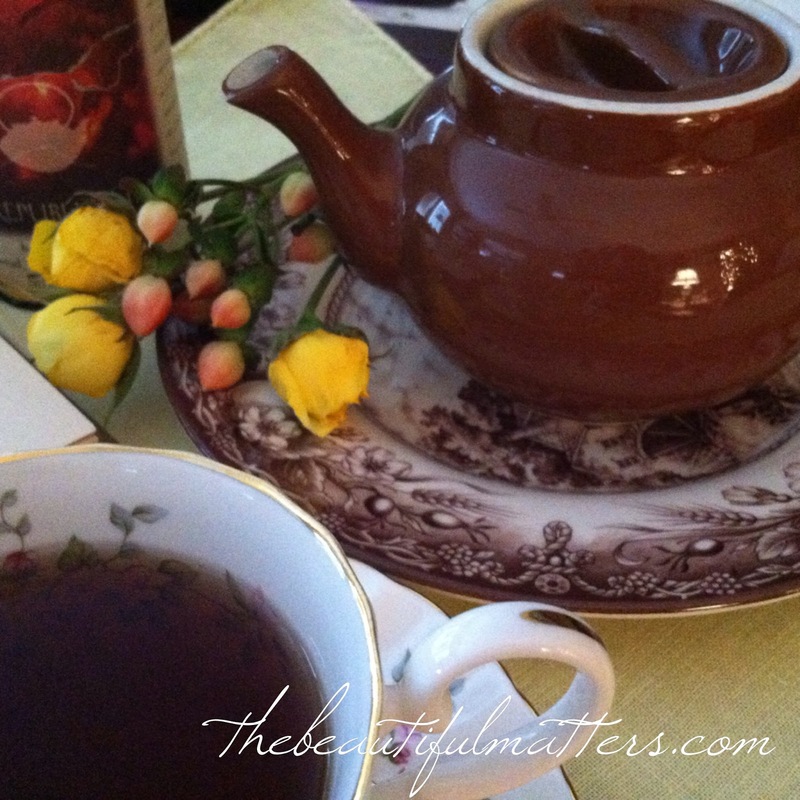 The little brown teapot is cute as is the teacup and plate. I didn't realize you live in Ontario. We go over there all the time. When our children were growing up we camped at the Pinery on Lake Huron every summer. Wonderful memories. We will have to check out Niagara-On-The-Lake. Love to go to Stratford when we get special ticket deals, too. Your kitty looks so cute peeking up from the chair. I love the teacup! I have a thing for china adorned with scenes and cottages. 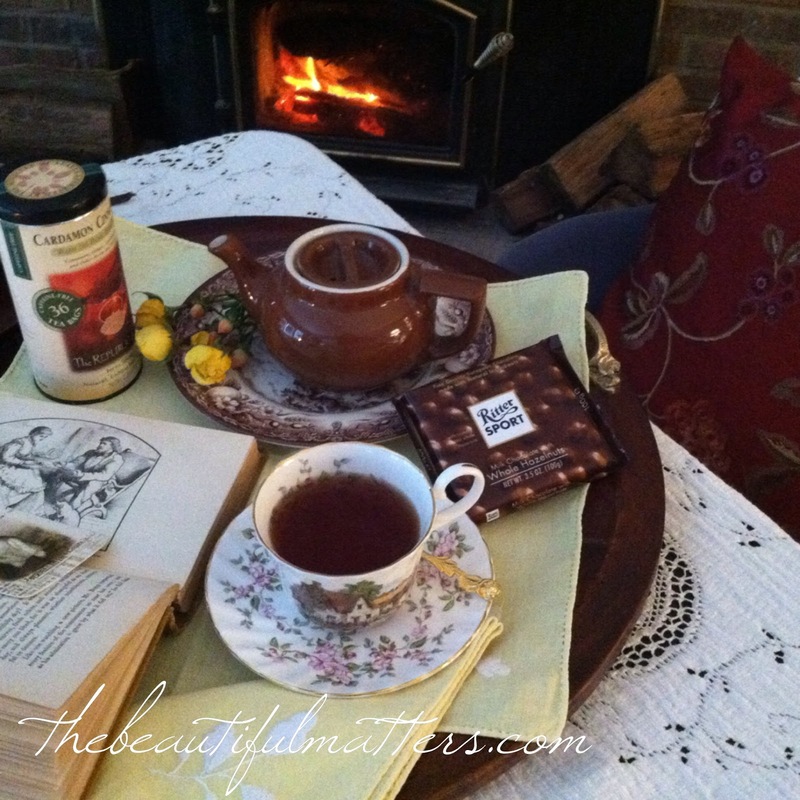 You have a lovely and cozy spot there by the fire to sip tea and read a good book. Thank you for joining me for tea and I'm sorry I'm late visiting. I was without my computer all day until now. Hope your computer problems are fixed now Sandi! I want to come to your house and enjoy a cup of tea with you! I'm happy to be visiting from Rose Chintz Cottage. 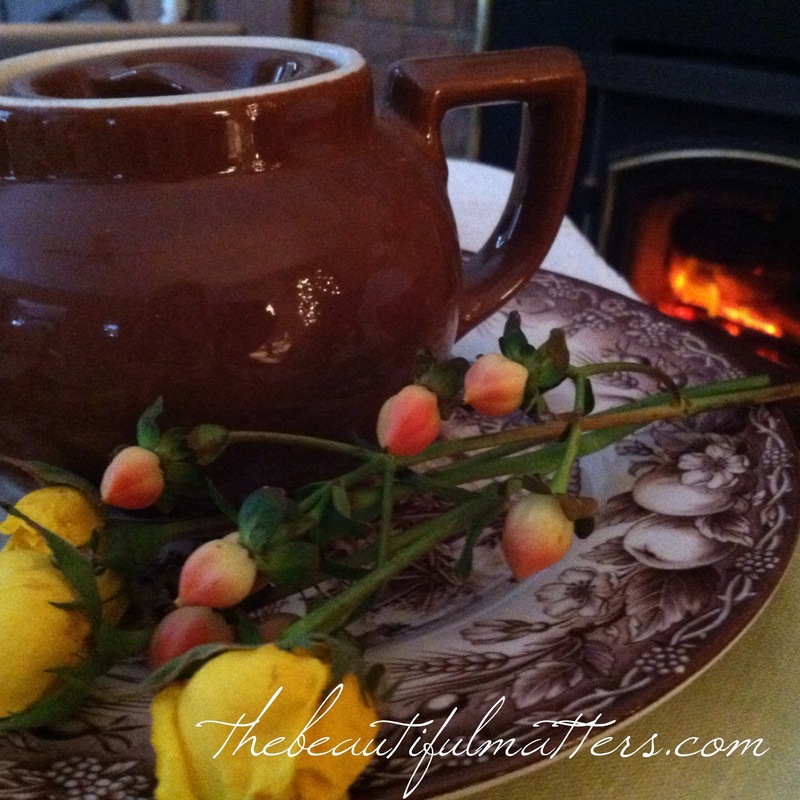 You've certainly got the right idea about how to enjoy a good cup of tea. There's nothing nicer, on a cold and blowing winter day! I agree :) How many times have I placed that mug of hot, fresh tea on the counter, and let it go cold? I'm much more likely to drink the whole pot, and enjoy it, if I set the pot, cup, saucer, sugar, spoon, and whatever-else, on the coffee table in front of me. I try to have a pot of tea each afternoon if I'm at home. Lovely teascape for one. 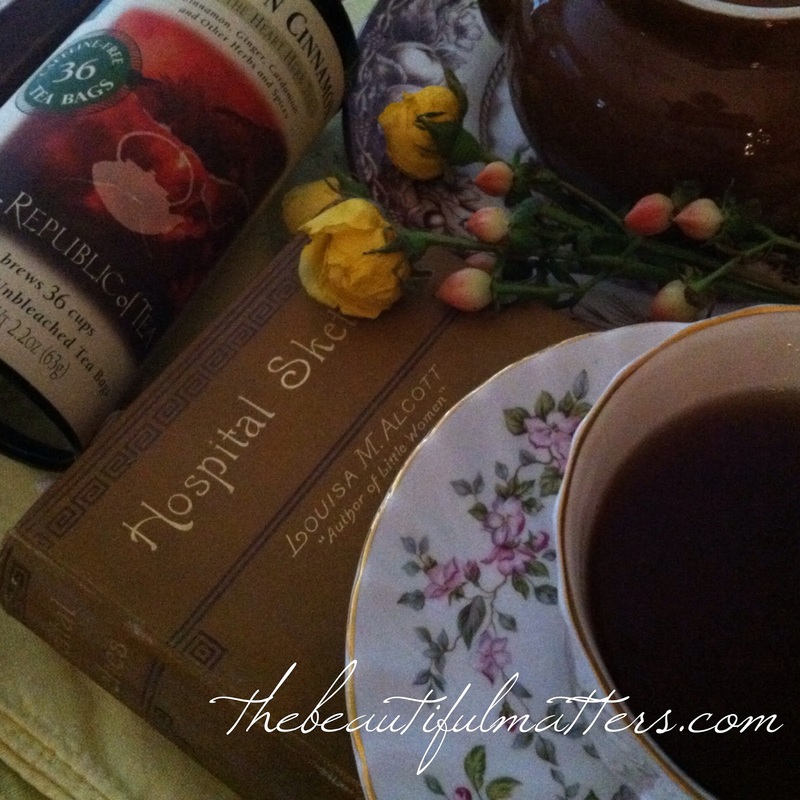 I love teacups with scenes -- does take you to another place while you rest with your tea! 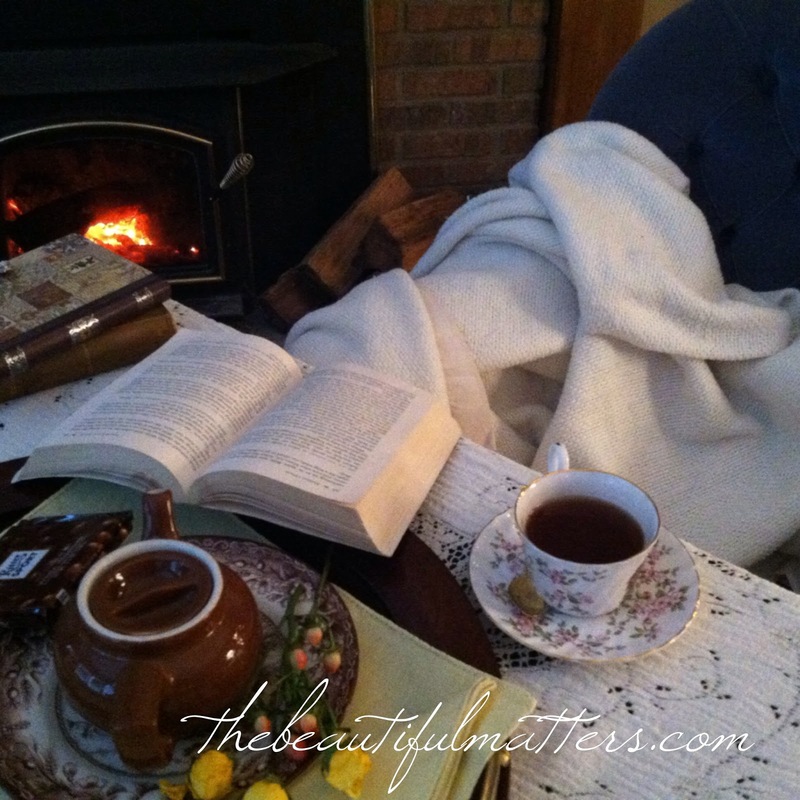 Nothing like tea, a good book and a nice blanket to cuddle up with on these cold days. 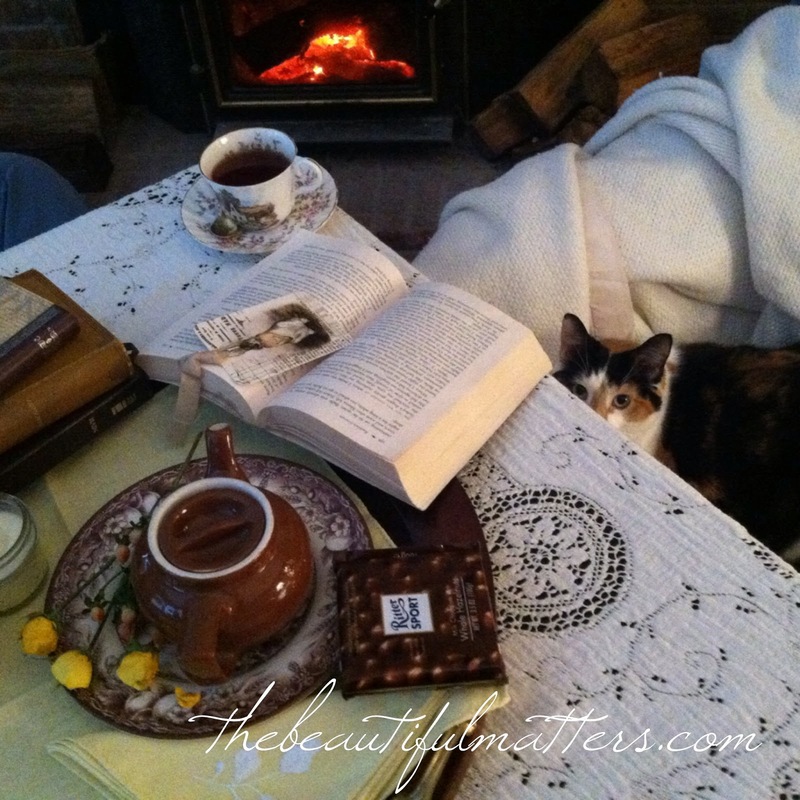 Add a kitty and chocolate -- purrfect! Happy Tea Day! Yes, and so hard to leave the house when it's cold and snowy outside and so warm inside. 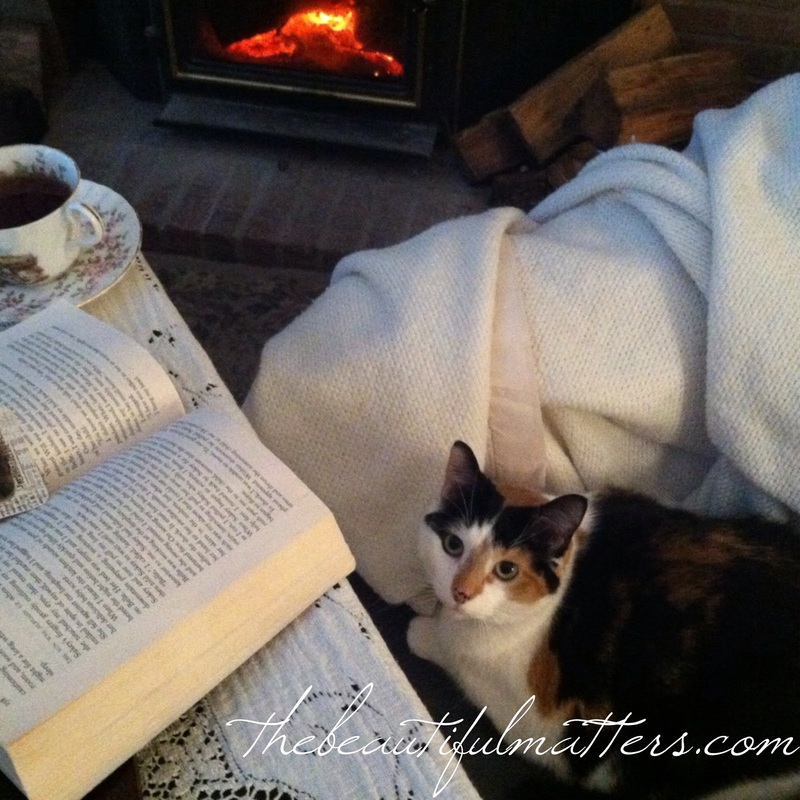 Your teacup is adorable, and your cat is a beauty - and quite curious! I agree with all you've said about tea for one. I just made her The Official Blog Cat :) ! (see sidebar) Thanks Beth.